I love this little boat, it’s a real mile munching little gem just like the shorter pilgrim, the beauty of this one is that it is expedition ready and a little bit faster! The Pilgrim Expedition is a slim, fast kayak with increased carrying capacity for camping & expeditions. The kayak is specifically designed for the smaller paddler and the taller and slimmer kayaker at the same time. This multiple-fit option is due to a raised area (kneebumps) either side of the cockpit. This kayak in my experience is phenomenal into a strong headwind, but equally as comfortable in rough water as its smaller cousin. The kayak has a low, rear deck for easy rolling, a white water type cockpit that gives excellent grip, control and allows quick exit if need be. 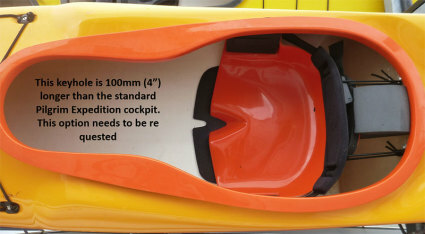 The sloping bulkhead behind the seat, allows the kayak to be emptied by lifting only the bow, no x-rescue is necessary. The Pilgrim Expedition is available with a long keyhole for no extra cost, perfect for those with longer legs.The kayak is fitted with the new high performance glass seat that is higher and can be adjusted forwards and backwards. Fitted hip pads with the option of glass thigh braces help to customize the cockpit area.